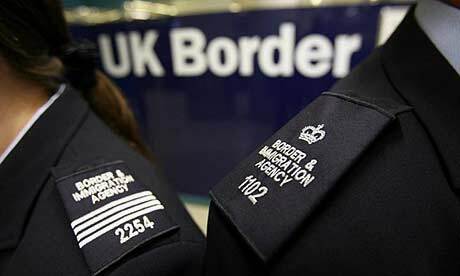 Any information about uniforms and rank insignia for the new UK Border Agency? Anyone who knows anything more about these? The Director General of the Border Force with the rank insignia that was in use before the one Sketor is referring to above. I think it's the other way around. That pic comes from a screencap of testimony Sir Charles gave to a parliamentary committee in March 2014. Note that his shoulder title is Border Force. The rank badges sketor posted were from the predecessor Border Agency. Because the UKBF was planned, to some degree, to be a kind of Home Office police force, and its first Director General was a seconded Chief Constable, I expected British police rank badges. Perhaps this is kind of the equivalent? The portcullis replaces the crossed tipstaves? In which case Sir Charles' badge of rank corresponds to that of Deputy Commissioner of Metropolitan Police. Found the new badges of rank at https://www.whatdotheyknow.com/request/ ... k_insignia. I'm not intelligent enough to know how to post them! The photo shows a portcullis, while the rank chart shows another figure. The shape of the wreath is also slightly different. the new badge features the gates of parliament in a wreath, just replace the portcullis with that. OK! But what was the original figure supposed to display? I think its just a cap badge. The insignia shown in the wreath in the images is actually that used for senior managers in the UK ambulance services and comprises a cartwheel (for transport) and the staff with two entwined serpents (for medical care; a variation on the caduceus / rod of Aesculapius). Its use for the Border Force makes no sense at all -- hence my guess that this is a cut-and-paste mock-up only and *not* the finished article. The Portcullis emblem with laurel branch on either side makes more sense and links back to the former HM Customs and Excise uniformed officers. It also neatly separates the Border Force from the standard police rank markings; I would expect this is far more likely to be the correct insignia used for all the senior ranks (where uniform is worn). There's a video report on YouTube of the official commissioning of the most recent UKBF Cutter by the Home Secretary -- the uniforms are all there to be seen, including the DG. As for the scheme of insignia themselves... good grief!! That rank scheme *must* have been designed by a committee -- it's just dreadful. 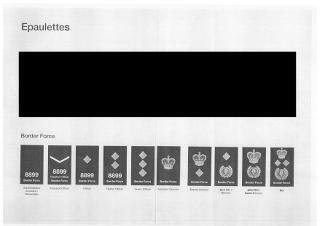 Having chosen to broadly follow the police pattern, why they couldn't simply have put together a chart based on a standard UK Home Office police rank progression from stars to crown (in standard size, not the WO2 over-sized version of the crown...!) is beyond me. This looks a bit like it was done by a departmental official who doesn't really understand the insignia. Adding the single star insignia at the lower end might be necessary to match their grade structure and that's why they've used one star as part of a broader continuum of "officer" grade insignia rather than using the three chevrons of a police sergeant. That much makes sense -- but I don't quite understand why they've then opted to use a single chevron and the text "ASSISTANT OFFICER" to identify the grade of assistant officer - in this context it seems an odd choice; why not simply use either the text on its own, or drop the text and use a simple device like a plain horizontal bar...? The use of *two* stars for the Director-General insignia also seems pointless. Why not just use a single star between the crown and the portcullis? Grade equivalence with the Deputy Commissioner of the Metropolitan Police in London is irrelevant; the DG is head of a national-level service so why should there be a comparison? Again, it just suggests a rank scheme put together by people who either don't understand or haven't thought it through properly. The cap badge also really doesn't need the wreath around the outside: the star with central badge and the crown above would have been fine! Interestingly, in the video I mentioned above, the DG seems to wearing a different cap badge -- although I can't make out the details. The other thing that looks odd is the lack of gorget patches for the DG on this style of formal tunic. Its all just very odd and looks a bit amateurish. Maybe the wreath around the cap badge only is for seagoing personnel (to make it more navy like). The image above is taken from a photo series of the launch of HMC Protector. In this photo, also from the launch, the DG's badge can be seen. It is different, as Medic said. Maybe other land based officers wear the same badge. Yep, that's the images I was referring to. The star with Crown and Royal arms at the centre of the cap badge appears much the same as that previously used by the now defunct UK Border Agency, so I wouldn't be at all surprised if the text around the outside of the shield was simply altered slightly to change the word Agency to Force. The DGs shoulder rank markings are the same as those shown in the photographs above. Although it's indistinct, the DG's cap badge appears to be all silver and looks like it's just the shield of the Royal arms, surmounted by the Crown and surrounded by the Garter, with the Honi-Soit-Qui-Mal-y-Pense motto, as used by the UK Government and in particular by the Home Office, which is the Department responsible for the Border Force. It could be a plain circle behind the shield with "United Kingdom Border Force" as the text (as per the other cap badges) but the little bit sticking out at the bottom below the shield makes me think the Garter is more likely! I know that UKBF has been deliberately established as an independent Home Office law enforcement Command (and hence the intention to follow police-type insignia) but one option would have been to use silver versions of the Royal Navy-type sleeve or shoulder-board distinction lace. This was previously used pretty much unchanged from the RN version as the insignia for the old HM Customs & Excise uniforms (with the portcullis emblem as the central part of their cap badges too!) so it would have had appropriate historical roots. It sure looks like the old UKBA badge. And I agree with Medic, the one chevron rank insignia looks terribly awful. Hey Luke -- yes, that UKBA blue ensign was one of my sources. I haven't seen any images of an updated UKBF version so I don't know if it has changed to a new defacing badge for UKBF or whether it's almost identical to the old version but with the one word change from "Agency" to "Force" (or maybe they just haven't bothered to update it at all and the Cutters are all still wearing the old UKBA ensigns -- knowing British public services it wouldn't surprise me at all and, let's face it, things like changing cap badges and flags are not at the top of their priority list at a time of austere public budgets...!!). Apologies in advance... once I'd started thinking about this, the ideas just kept rattling around inside my head so I gave in and decided to get on and do the drawings! This is definitely NOT the official UKBF insignia and badges; this is what *I* would have suggested. I've tried to stick to their scheme as much as possible but I wanted to tidy it up a little (!). The organisation's corporate badge and the cap badges are entirely my own concotions, although I have incorporated the historical Tudor portcullis badge, previously used by the former HM Customs & Excise. I think the portcullis is an appropriate emblem as it very much suggests the role of the Force as the guardians of entry into the country, although I suspect the portcullis was deliberately NOT used as it might also be thought to look a little like the UK is trying to keep people out, which could be seen as unfriendly. Given the public mood in recent elections however... (!). Anyway, in keeping with the intended role as a Home Office border police / enforcement service, I have stuck to dark blue uniforms with silver badges and insignia. This fist pic is the rank scheme and various badges. The DG and directors wear standard UK police-pattern cap embelishments and gorget patches (essentially army-pattern but in silver), as worn by Chief Constables and Deputy / Assistant Chief Constables. Deputy and assistant directors have one band of plain raised embroidery and no gorgets, matching police Superintendents and Chief Superinitendents. All other caps have plain patent peaks. The second pic is the formal uniform -- which probably wouldn't be worn all that much in practice. I guess the day-to-day working uniform would remain dark blue cargo/combat-style trousers with dark blue shirts and the epaulettes shown above. The final pic is a possible alternative version; it could be for all staff but I originally intended it it to be a specific variant for the permanent crews of HM Cutters. The rank lace (and the rest of the uniforms) is pretty much Royal Navy pattern but with silver instead of gold. Note the different cap badge to the other uniformed officers and the use of RN-pattern oak leaves on the peak. I guess the four-stripe rank would be the overall manager of maritime operations and the three-stripe rank would probably be the CO/Master of each cutter, with other roles ranked as appropriate. All other uniformed staff seconded to the cutters for operational / enforcement duties (as against maritime operational roles) would continue to wear the standard police-style uniforms. The uniform on the far left in the last pic is a bit of a visual joke: the current Director-General was formerly a Royal Navy Vice-Admiral (and Second Sea Lord), so I couldn't resist including this, although I don't suppose there'd be much need for the DG to have this version of the uniform as well...! While we're fantasizing a good scheme: I wondered why the UKBF used such odd rank titles. What would be wrong with using police-type titles in the first place? BTW the UKBF has black uniforms with silver insignia. I think Officer is the standard rank (I've never seen anyone at a British airport with less than one pip on their epaulettes) and Higher Officer is the first supervisory rank. Given they both wear their number on their epaulettes, I assume they're meant to equate to constable and sergeant in British police forces, as inspectors and above do not wear their numbers. Maybe the weird single chevron Assistant Officer is meant to be a (non-sworn) PCSO equivalent or something. Interesting and the insignia for senior officers is more accurate but those still don't look like official images (e.g. the crown is too big and the design not entirely correct).